Ever since Donald Trump declared that he would build “a great wall” on the U.S.–Mexico border to keep out drug dealers, rapists and other undesirable immigrants, people have been lining up to take turns whacking him with a stick. The Trump piñata became a common sight at parades, rallies and birthday parties over the course of the long presidential campaign. Filling up a papier-mâché effigy of the president-elect with candy and beating him with bats might not have been the most nuanced political statement, but it was cathartic, and reinforced the sense that The Donald was nothing more than a joke. But then, Trump won. Piñatas of the president-elect have popped up at protests since, but it’s hard to guess how the larger Trump piñata market . might be reacting to the reality of a full Trump term. Throwing on a blindfold and going to town on a miniature version of a candidate (or a reality show star) is one thing, but amid calls from leading lights like President Obama, Nicholas Kristof and Shaq to “give Trump a chance,” pummeling the future leader of our nation might seem like a step too far. Demand may be down due to fear — if the president-elect feels that people burning the American flag should (“perhaps”) have their citizenship revoked, it’s fair to say that he might not take kindly to political piñata enthusiasts once he’s in the Oval Office. Or demand might be up! Every call for civility has been countered with a call for sustained resistance, and some have reacted to Trump’s thoughts on flag-burning by burning flags — a stress-relieving thwack at the hollow torso of the president-elect might be just what the nation needs to get through the next four years (plus, candy). 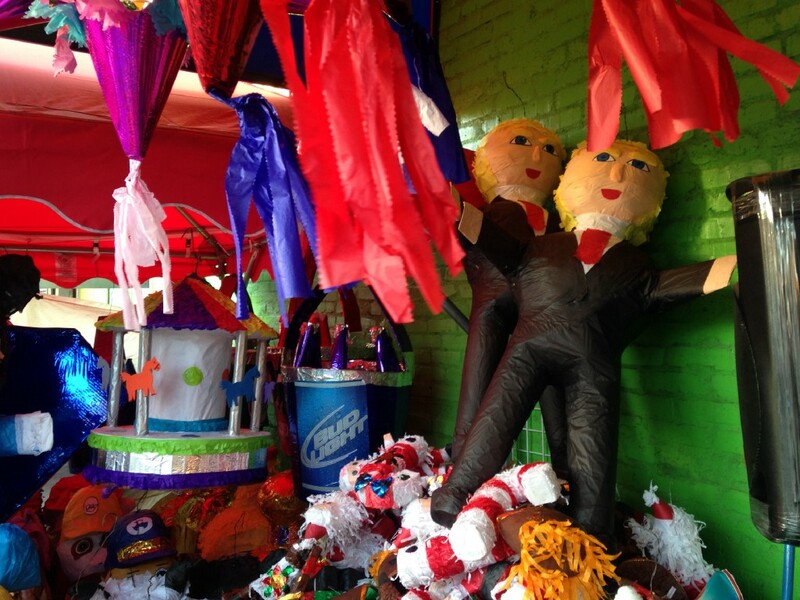 So I went down to the piñata district to find out: In the aftermath of Election Day, are Trump piñatas still selling like hotcakes? “To tell you the truth, no, we haven’t even had any in stock,” said Omar Arzate, a manager on duty at Jack’s Wholesale Candy. There were plenty of superheroes, burros and cartoon characters to knock around, but zero future presidents of the United States. Even their supply lines seemed to have dried up. “The people that used to bring them in, we haven’t seen them since the election,” Arzate added. Around the corner, at the stretch of Olympic Boulevard that’s dense with piñata shops and taco stands, the picture looked similarly bleak. The flagship store on the strip, Raquel’s Piñata District, had zero Donald Trumps among the Christmas stockings and giant Santa Claus heads. Point taken. But farther down the block, a shimmering cluster of Trumps were hanging from the ceiling of a store called Piñatas Place. I asked if he was concerned that fear or respect for the office of the president might turn piñata shoppers off. 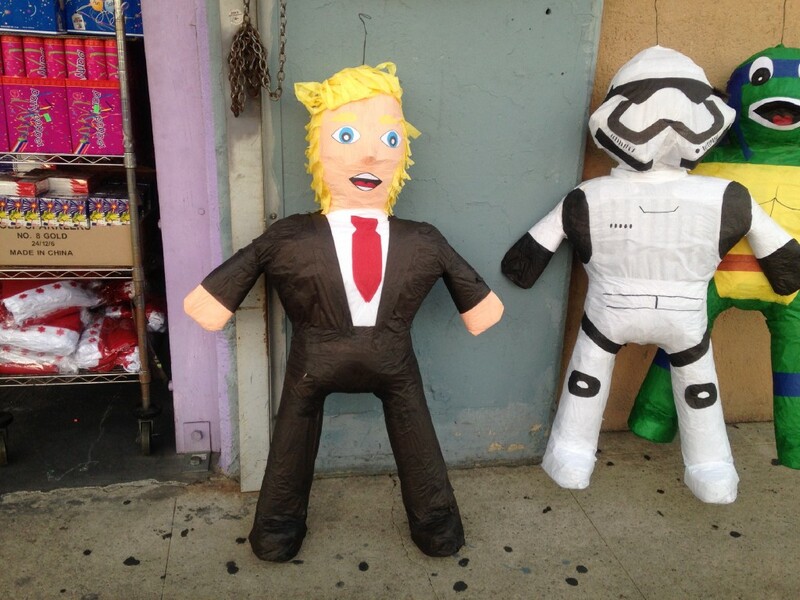 After leaving Piñata Place, I started to find Trump piñatas at every one of the smaller stores on the block. Fiesta Mex had a handful out back (“We’re selling the same as before the election”) and El Cora Productos had them hanging over their candy section. Across the street, Los Perez Cash & Carry had a gaggle strung up in back. 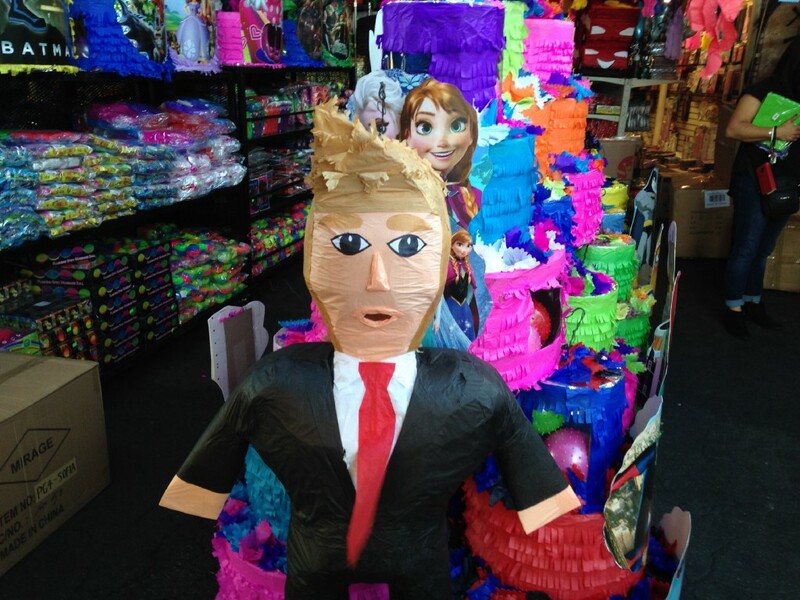 Their employees said they don’t do interviews, but one chimed in to say that he thought the Trump piñata should fade away after Inauguration Day (then added that “if people keep asking for them, we’ll probably keep selling them”). But the strongest outpost of presidential piñata production seemed to be Amazing Piñatas, the large store holding down the western end of Piñata Row, which not only has generic Trump piñatas in stock, but makes more detailed custom effigies for buyers who want to whale on a more accurate representation of our future commander-in-chief. The piñata proprietor, Patricia, and her daughter, Nessa, were both optimistic about this segment of their sales. 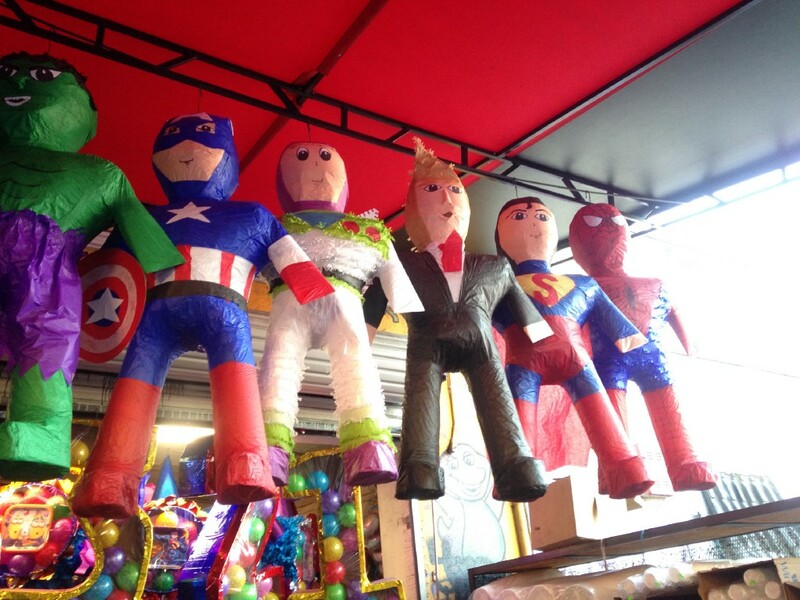 “If any piñata sells, it will be Trump,” Nessa added. 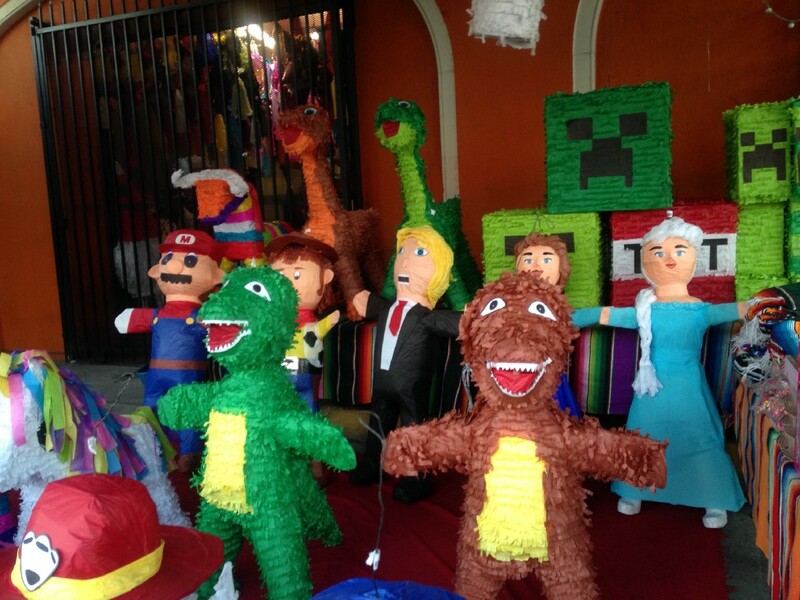 Their custom piñatas sell for over $100 — a price their customers seem happy to pay. 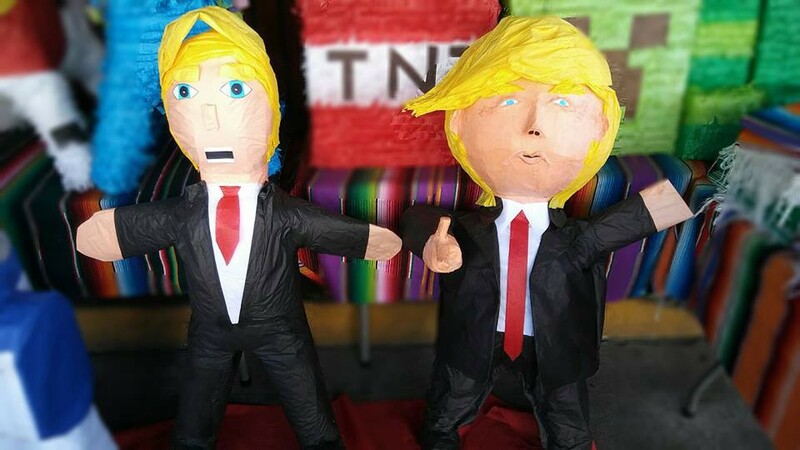 “Sometimes the generic ones, they might not make the person too happy to beat up,” Patricia said, “so they want him specific ways.” Customers can send in a reference photo, and have Amazing Piñatas’ in-house artists try to match the Trumpian expression. Patricia says that customers buy Trump piñatas for protests, birthday parties — even birthday parties for dogs. And in the interest of nonpartisanship, Amazing Piñatas did make a Hillary piñata a while back. “But people don’t want to buy it,” Patricia says. The fact that stringing up a miniature woman and beating her with a stick bears an uncomfortable resemblance to domestic violence might dissuade even the most virulent Hillary haters from a piñata purchase. 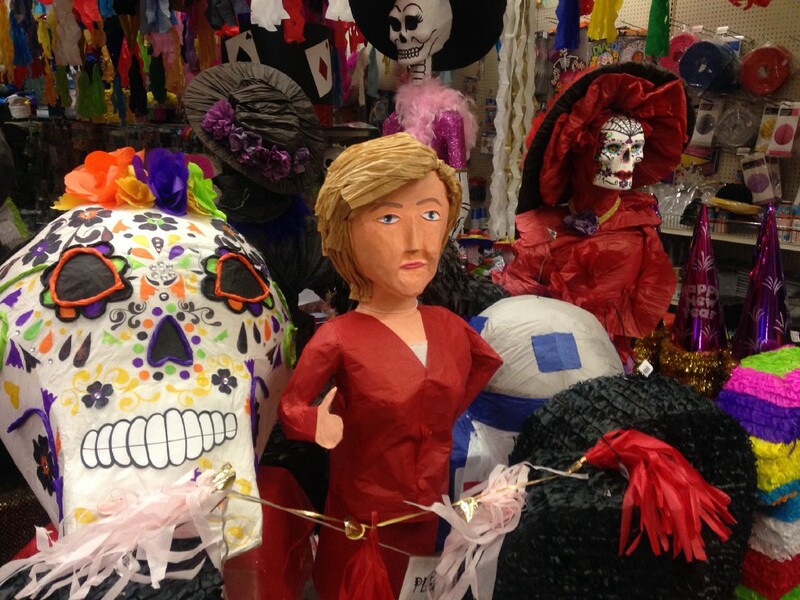 Patricia just chalks it up to the left-leaning bias of Southern Californian piñata buyers — now papier-mâché Hillary is just a fixture on her showroom floor. I asked if she shared any of the concerns that her fellow piñataeras had expressed, or gotten any negative feedback on Amazing Piñatas’ active Facebook page.